It’s a new year now! This means more info, lots of upgrades to software, new bookings and a plethora of experiences to share, so let’s get started. As a talent you always have rights. Having a talent agent negotiate on your behalf is terrific, but not everyone has an agent and a growing number of clients prefer to work with talent one-on-one instead since most have home studios to work from. I encountered a new client who was GREAT to work with. But at first I was a little wary. Here’s why. She was inexperienced at hiring Voice Over talent and in the beginning wanted me to sign a highly unusual contract. 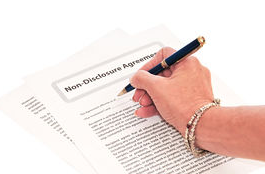 Non-Disclosure Agreements are more than totally normal and even I admit that in the super early stages of my career I didn’t understand them very well. Since then I have matured significantly with quite a few clients able to vouch for my loyalty as well as professionalism. But this situation proved a bit freaky. It occurred to me that anyone new to VO reading my blog would need to know a few things before signing away their freedom. -Keeping quiet about the project and not sharing info about it on Social Media without permission. 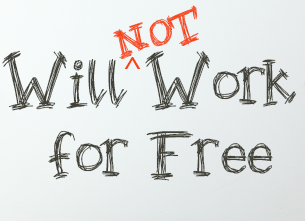 -Agreeing to multiple retakes free of charge across a minimum of 90 days. Now, I had major issues with 2 out of 3 of the rules above. Can you guess which ones? Again, this person was new to hiring professional VO talent, so it was important to show patience as well as respect when it came to explaining of why I refused to sign the NDA. “If an impersonation misleads the listener to think they are hearing a real celebrity ‘endorsement’ (commercials, political ads) then the real celebrity can take legal action. Theories include appropriation of personality, and passing off to advertise a commercial product like a weight loss product, skincare, or jewelry. So, anything that suggests a celebrity endorsement, and/or derives some commercial advantage for it, should not be done. If the voice is clearly an imitation or parody, and not the actual celebrity, it doesn’t apply to legal worries. Nobody has a right to a specific voice, otherwise many people would have to go mute for their entire lives. Also, impersonators would be banned legally and there are more than enough who make a living doing so in Voice Over, in film, on TV (Saturday Night Live), on stage, or in person at carnivals, fairs or theme parks (Elvis Presley, Marilyn Monroe, etc.). I know hundreds of clients who look for voice overs who can sound like Morgan Freemen, Sigourney Weaver, Scarlett Johansson and others because they can’t afford to pay 6 or 7 figures to hire the celebrities themselves. In some movies voice overs are hired to come in to record a few lines or vocal reactions if the producers can’t arrange for the lead actor to come back for retakes. In animated movies there are some occasions when celebrities don’t want to make exertion noises (screams, sighs, dialogue while running, funny sounds, and so on), because they were unable to make them sound authentic. And don’t forget about characters who sing. Few celebrities can hold a tune in an animated show or movie, so they hire singers who have the same vocal quality to sing for the character instead. Need examples? Look up the singing voices for Aladdin and Jasmine, then look up the voice actors who spoke the dialogue. That’s just one example out of hundreds. Here’s another, remember classic film versions of musicals like The King and I, My Fair Lady, or West Side Story? Believe it or not, the lead actresses in those films didn’t do their own singing for the musical numbers. Producers hired a “Ghost Singer” to perform the songs and the actors lip synced them. I kid you not. Google Marni Nixon and you’ll learn more about this amazing woman who many never knew was the singing voice for a number of leading ladies in musicals and as well as dubbing their voices occasionally on film. “As long as they don’t say ‘I’m Morgan Freeman and I endorse this movie/message/product’ then they’re safe. There is not copyright or trademark right to a voice. The client read my email, was fully impressed and agreed to remove the warranty part out. Then, instead of the 90-day agreement to record retakes of lines as needed, I agreed to a specific time frame. The product was scheduled for release near the end of January, so between now and then I offered retakes free of charge but only for a couple of times. If the client goes over the limit of 5-10 (depends of length of project) then I’ll have to charge for my time. Remember it’s not just the voice over, it’s the editing too. I’m not sharing the price I negotiated because that’s a personal matter that’s going to be different for everyone. The factors that weigh in are my experience, my use of equipment, my time, and the use of my voice for a paid product. It all worked out and the client was very happy.